Beth Lisick has reviewed the July 31 benefit concert at the Victoria Theater. It was an undeniable tribute to a musical chameleon who once played in a band called Impossible Underpants and put out a solo record under the name Fudge Bridges and his Li’l Box of Candy. 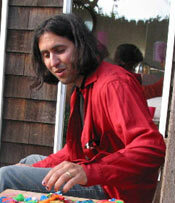 The July 2003 issue of the Transbay Creative Music Calendar was called “Remembering Matthew” and included brief essays/remembrances by some of the creative improvisers who played with Matthew over the years. Here is Matt Ingalls‘s contribution. The July 2003 issue of the Transbay Creative Music Calendar was called “Remembering Matthew” and included brief essays/remembrances by some of the creative improvisers who played with Matthew over the years. Here is Gino Robair‘s contribution. Where to begin? Your sense of humor. You loved to remind me of how we first met -I brazenly introduced myself to you at the Seattle festival-and, of course, I didn’t remember you the next time we met. I’m here to tell you that this never happened again! It didn’t take long for me to find a kindred spirit in you: musically, personally, socially. I soon learned we had many things in common: gamelan, improvisation, star sign, foods, etc. A true Scorpio, you carried a sense of mystery — not in any threatening way — but you always had a surprise up your sleeve. The July 2003 issue of the Transbay Creative Music Calendar was called “Remembering Matthew” and included brief essays/remembrances by some of the creative improvisers who played with Matthew over the years. Here is Dan Plonsey‘s contribution. 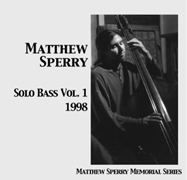 I want to jot down my impressions of one aspect of Matthew Sperry’s performance which may not be apparent to those who know his music only from recordings: the manner with which he played, and in particular, the grace with which he manipulated all those _things_ which he used on his bass. mallets and wooden hammer, and others. I would guess that some were chosen for more than their acoustical properties – evoking other aspects of human life, as though Matthew was attempting to infuse his own passions into the bass itself. The July 2003 issue of the Transbay Creative Music Calendar was called “Remembering Matthew” and included brief essays/remembrances by some of the creative improvisers who played with Matthew over the years. Here is Phillip Gelb‘s contribution. Those who know me personally, know that Matthew Sperry was a very close friend for many years as well as a bass player i often worked with. In 1990, i attended graduate school at the Florida State University School of Music. Shortly after arriving i was looking for a place to live and someone introduced me to Matt who was a junior at the music school, studying bass. I ended up moving into his apartment and for 2 years we were roommates. A close friendship began that we knew would last a lifetime but i had no idea that would be cut short by yesterdays tragedy when he was hit by a truck while riding his bicycle to work in Oakland. The July 2003 issue of the Transbay Creative Music Calendar was called “Remembering Matthew” and included brief essays/remembrances by some of the creative improvisers who played with Matthew over the years. Here is Tim Perkis‘ contribution. I know that what I’m about to say is absurd, since death can come to any of us at any time. But I think the shock of Matthew Sperry’s death is so doubly great because Matthew seemed the least likely candidate — it’s hard to imagine someone more open, loving and alive. I jumped at every chance I ever had to play with him, knowing that the music he would bring would be clear, exciting, and full of the good humor that he always radiated in every sphere of his life. He had the kind of skill that never looked like mere skill, that disappeared in a larger musicianship that reflected who he was, that made everyone sound good, and, just as in even the briefest conversation with him, would leave you feeling happy and alive. Matthew, Can You Sperry Me Again? Comments Off on Matthew, Can You Sperry Me Again? The following remembrance by Stuart Dempster, Professor Emeritus University of Washington School of Music, was posted as a comment to the initial Matthew Sperry passing announcement. The webmaster made a full post of it with Dempster’s permission. The title above goes to a score (immediately below) wherein I have welcomed Matthew Sperry, in his untimely passing, into my body and mind. The score is simply to allow Matthew Sperry, and his memory, to process soundly through the performer. During the time of Matthew’s death on the morning of 5 June 2003 I had decided rather urgently to listen to the new Brainstun 2 CD that was about to be released; I had not heard anything by Matt for well over a year. Christian Asplund had sent a preliminary copy of the CD a couple of months earlier for the purpose of writing a blurb. * During that fateful morning I was playing some form of “needle drop” whereby I was concentrating on finding the “Construction” and other tracks that featured Christian and Matthew. I was not listening to the CD all the way through but rather seeking out the Matthew Sperry playing. Even now, some five weeks later, I cannot fathom why Matthew chose to visit me in that way, essentially saying “goodbye” to me. I did not read the email about his death until early the next day. This week’s installment of Prisms (KBCS Bellevue/Seattle, 91.3fm, 12mid-3am PDT, 7 August 2003 — i.e. late in the evening of 6 August) will have a Matt Sperry-related component, sometime during the first hour. This particular program returns to a theme visited several times before on Prisms: the fragility of life, the sadness of passages. 2003 has already seen the passing of a number of composers and performers, some prominent, some rising stars, others known perhaps only to a few. Yet they were all precious to someone, and now they are gone. We’ll reflect on a few of these losses; on the sadness of losing loved ones in general; on the fact of life as a continuum from birth to death; and more. The far-flung selection of works will include Boulez’ (relatively) new recording of Pli Selon Pli, Grana’s Humanist Requiem (with words by Kurt Vonnegut), pieces for (American) Javanese gamelan and Madagascan valiha, plus live concert performance by Mike Watt and the Secondmen, among other things. If someone in the Seattle area has good reception of KBCS and is willing to tape the show for others, please do so and leave a comment here. People outside of the Seattle area can then use this site to request tape copies. Some of Scot Hacker’s quick / late-night notes/memories from tonight’s benefit, while the evening is still fresh in mind. Hard to imagine a life better eulogized than Matthew’s was at tonight’s Matthew Sperry benefit concert at the Victoria Theater. A love vibe that filled the house top to bottom (500 seats, sold out and then some). Orchesperry assembled just for the occasion — ~15 creative improvisers flying low under the outside umbrella. Pauline Oliveros Quartet with accordion, koto, shakuhachi, trombone — Oliveros one of the great American avant-garde composers, now in her 70s and keeps going deeper. Beautiful, meandering, meditative piece. Red Hot Chachkas with a rousing set of Jewish klezmer music. Matthew played with them too – even played bass at his own wedding with them. Very funny Yiddish song: How the Czar Drinks Tea. Tom Waits appeared solo, on guitar first, then piano, played for around 45 minutes, mixed old songs and new, heart totally in it, genuine, loving, funny even when stumbling on older lyrics. Cast/band from Hedwig played a reunion — not the full show, but most of the songs from the show. Hedwig composer/lyricist Stephen Trask flew out from NY, as did musicians from the NY production. Strange to see the band out of costume and out of context – must have seemed really weird for those who never saw the show itself. Matthew had played with every musician/group on stage tonight – his playing was so incredibly diverse. Never academic, always humble. No one there had ever seen all of Matthew’s musical involvements laid out all at once, in spectral contrast like that before. By midnight, a wonderful but kind of unwanted feeling of closure. This was the final big benefit/memorial. Time for all of us to move on, and this night kind of makes it possible to do that, but I think we all sort of resist that feeling too — many of us not yet ready to “move on,” although we are and we must.